It's been another busy week, with more than 100 proofread puzzles sent in—including the last from 1966! Saturday afternoon Tracy Bennett sent in 30 puzzles with 50 mistakes, which were followed Sunday afternoon by 15 puzzles with 30 mistakes from an anonymous proofreader. Tuesday morning Denny Baker sent in 31 puzzles; early Wednesday morning Wei-Hwa Huang sent 10 puzzles with 13 mistakes, which were followed that afternoon by 18 puzzles with 18 mistakes from an anonymous proofreader. Thanks so much, everyone—we're doing great! The 1966 puzzles have now been sent to Jim Horne at XWord Info and should be up soon—thanks again, Jim! Last Friday I posted the Blast! challenge at 4:08 p.m. Pacific time. At 4:30, just 22 minutes later, Jeffrey Harris was the first of four readers to send in the correct answer—congratulations, Jeffrey! As promised, on Saturday I started replacing the blank underscores, hangman-style, with a new letter each day so everyone could keep getting hints, and during the course of the week several other people submitted correct solutions. The clue, "Husband in the good old days," was from the June 22, 1959, puzzle, and the answer was LORD AND MASTER. Pretty amazing—times have definitely changed for the better! If you'd like to try solving this week's Blast! challenge, check it out in the sidebar to your right. A new letter will replace its corresponding blank underscore(s) each day, so if you don't come up with the answer right away, you may later on in the week! Earlier this week I received an e-mail from litzer, proofreader, and historian Todd Gross about some pre-Shortzian constructors he'd been researching. One of these was Jane S. Flowerree, who published four puzzles under editor Eugene T. Maleska. 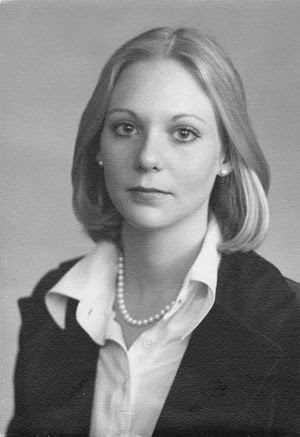 When Todd discovered that Jane was an attorney, he contacted attorney/litzer Vic Fleming and asked if Vic could make an initial contact with her. Vic was happy to oblige and reported back that Jane had said her puzzles were "all done manually during the Maleska era" and that she had often worked on them "while waiting in carpool lines, taking her kids to and from elementary school."
. . . I hope I am sending you the right photo. It is probably the only photo ever taken of me with a crossword puzzle in it (sitting on the table next to me). This was pretty representative of my life when I started constructing crosswords, so I thought it would be appropriate. You will see what I mean when you read my answers to your questions. . . . I saved all my correspondence with Mr. Maleska and could find most of it, which helped me answer some of your questions. I also saved the fan/hate mail. . . . Many thanks to you and Vic and David for sending me on a trip back down memory lane to my “glory days”. . . . I hadn’t thought about it in a long time and the vast majority of my friends and acquaintances have no idea that I ever constructed crosswords. I think they would be surprised. . . . I am a little worried that some of my responses might sound bitter, but I assure you I am not! Suum cuique! I quickly scanned in one of Mr. Maleska's letters. I chose it because he talks about how he felt when he first saw his name in the TIMES. That particular letter was written before he started receiving mail on the puzzle he refers to. When the letters came in, he forwarded them to me. He would tell me if he already responded to each letter writer or if he wanted me to do so. I scanned in a negative letter and a positive one. . . . I remember one woman sent the puzzle back shredded like confetti, which was kind of funny. I've inserted these letters, as well as the other images Jane sent, into the interview, which you can read here. Thanks so much again, Jane and Todd, for this wonderful window to the past!